This page is a collection of short vertical antennas that I built over the years, for the 80 mtr band. With "short" I mean between 3 and 10% of λ. That is a lot shorter than a standard 1/4 λ vertical. Anything less than 75% of full-size is actually a real compromise. I am not interested in local QSOs, so I'd like my antenna to have a radiation pattern with a relatively small takeoff angle. Radiation straight up is to be minimized. The antenna has to be installed on my terrace, and I do not have the room for a network of radials - certainly not radials with a length of 1/4 λ on 80 mtrs. A tall order indeed! The radiating element of a vertical monopole antenna is basically half of a dipole. The missing leg of the dipole has to be replaced by something else, for the monopole to "push against". This typically takes the form of one or more radials. Let's take a monopole radiator that is short with respect to the desire operating frequency. To make it resonant at that frequency, some form of loading is required. By the way: resonant operation is not a requirement - it just makes coupling to a feedline easier. 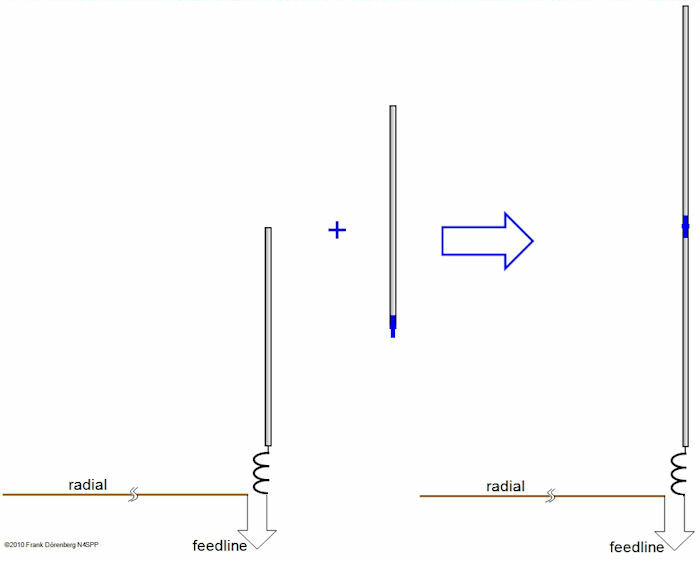 One standard solution is "inductive loading": placing a loading coil somewhere between the feedpoint at the bottom of the monopole and the tip of that monopole. The current-distribution along the radiator is such that the current is highest at the feedpoint. Placing a loading coil here, requires the smallest inductance. The current-distribution tapers off, from maximum at the feedpoint to zero at the tip of the radiator element. So, as the loading coil is placed farther away from the feedpoint, a larger inductance is required. At the tip of the radiator, the current is zero. This would require an infinitely large inductance. See the diagram below. 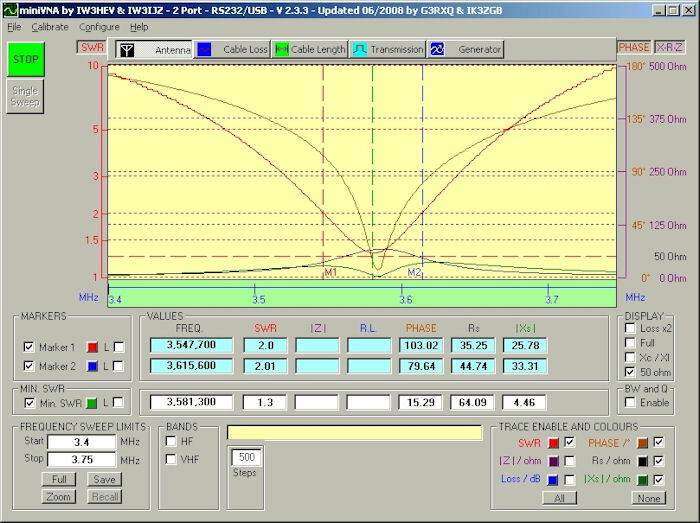 The placement of the coils does affect the shape of the current distribution, but does not change the fact that it is maximum at the feedpoint and zero at the tip. Base-loading (i.e., at the base/bottom of the vertical radiator) is often easier to construct than off-base loading. Also, coil placed at the based of the antenna may be more easily accessible. So why not always use base-loading? 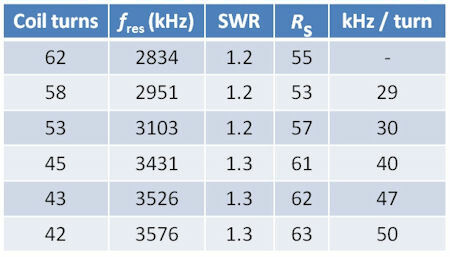 This is primarily driven by coil losses, hence, efficiency of the antenna. The coil losses basically depend on the current, coil dimensions, material, construction, and core. Depending on the diameter of the radiator element (tubing, wire) and installation height, the most efficient placement of the loading coil is somewhere between 30 and 60% away from the feedpoint (ref. 3, 4). I.e., around the mid-point. Note that the efficiency-vs-placement curves are fairly flat over a relatively large range around the mid-point. Note that this tends to shift towards the tip of the monopole when "capacitive hat" loading is added. Ref. 3A, 4. Install the antenna (incl. radials!) as high as possible above ground (ideally > 0.05 λ), preferably over "good" HF ground. Damp garden soil is "good", swamp is better, salt water sea or ocean "best". Rock, (reinforced) concrete (such as my terrace...) and hard surface in general is "bad". A reduced-size vertical antenna (radiator + radials) is easier to install higher up. A single, or a few (3-3) radials elevated at least 1-2 meters (3-6 ft) above "good" or "moderate" ground can be sufficient. Elevating the radials reduces the near-field absorption losses to ground - 0.03 λ is an absolute minimum installation height, esp. if fewer than eight radials are used. When only a few (elevated) radials are used, the heavier the radial wires are, the better. Especially with an elevated radial system, suppress common mode currents on the feedline with a current choke. Performance-wise, the most effective form of loading is "capacitive" end-hat loading, due to the way it changes the shape of the current distribution along the radiator. It adds hardly any loss resistance, whereas losses in loading coils (esp. placed at the base where the current is highest) are often quite significant. Increasing the diameter of the radiator from a thin wire to 10-12 mm (1/2") does more for improving performance than increases beyond that. Any wire, however short and crooked, can be made to radiate. Despite the above recommendations, the short verticals on this page are all base-loaded, and with just one or three short radials. Primarily for construction reasons, and because I converted some of them from center-loaded dipole experiments. Short dipoles for the lower bands (40 mtrs and below) do not perform well for DX when installed horizontally at low height: significant ground losses, and a high radiation takeoff angle. Take half a loaded dipole, add a single elevated radial and you have a loaded L-antenna (ref. 1) or a shortened "Up & Outer" antenna (ref. 2A/B/C). The latter is Off-Center-Fed: a 1/4 λ vertical with a single horizontal radial that is 25% shorter than the vertical radiator. 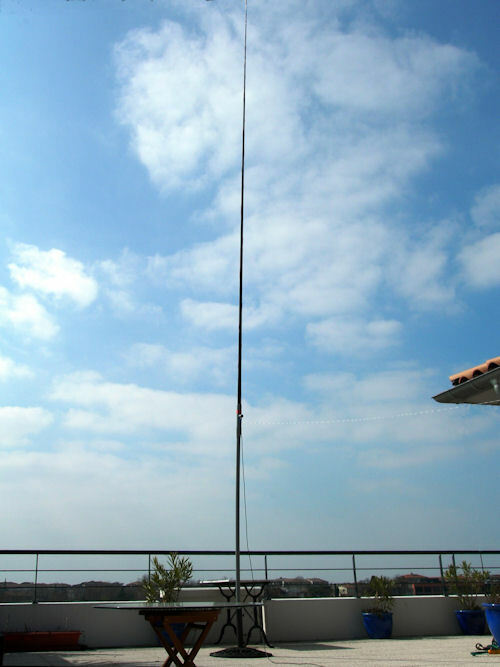 The "Up & Outer" antenna is typically installed close to the ground (60 cm -1 m, 2-3 ft). In general, discussions about loading of dipole antennas (e.g., ref. 3-9) equally apply to vertical monopole antennas. For my short 80 mtr mid-loaded verticals, see this page. My short 80 mtr linearly-loaded vertical is on this page. My short 80 mtr end-hat-loaded verticals are on this page. For the vertical radiator, I re-used aluminum tubing from a dipole experiment. It is 2.5 m long (8.2 ft), has an outer diameter (OD) of 7.5 mm (≈5/16") and an inner diameter (ID) of 5 mm (≈3/16"). I had already tapped a standard M6x1 thread into the tube ends. I wind my loading coils on PVC tubing from the Do It Yourself store. From my available materials, I chose tubing with 32 mm OD (1.25") for the core of the coil. A 2 m (6 ft) section of PVC tubing with an OD of 40 mm (1,6") will serve as "mast", stuck into a heavy cast-iron umbrella stand. I glued a 40-to-32 mm PVC adapter piece to the bottom end of the coil core. This way, the antenna can simply be stuck onto the top of the mast. I installed a BNC jack towards the bottom end of the coil core, and a banana jack next to it. The latter is connected to the ground solder-lip of the BNC jack. The radial wire is plugged into it. The bottom end wire of the coil is soldered to the center conductor of the BNC jack. Note that the 40-to-32 PVC adapter piece is not glued onto the core - at least not until the number of wire turns of the coil has been adjusted for the desired resonance frequency! A 32 mm female-to-female coupler sleeve is glued to the top end of the core. It receives a 32 mm insert for a screw-on end-cap. An M6x25 bolt is installed into this end-cap, with washers and a lock-nut. The radiator is screwed onto the bolt, and is easily removable. As a "counterpoise", I use a simple 7 m (22 ft) radial made of "zip cord" household hook-up wire. It is strung horizontally, from the bottom end of the coil core. No particular reason for using 7 m, it is just the length of wire that I had on hand. Also, I cannot fit much more than that on my terrace (in a straight line). Note that a small number (e.g., 1-4) of elevated radials can be as effective as a much larger number of radials in or on the ground! See ref 10. In my case, the antenna and the radial are 2 m (6 ft) above the terrace floor. According to loaded-dipole calculators such as ref. 2D, I need a loading coil of about 80 μH. 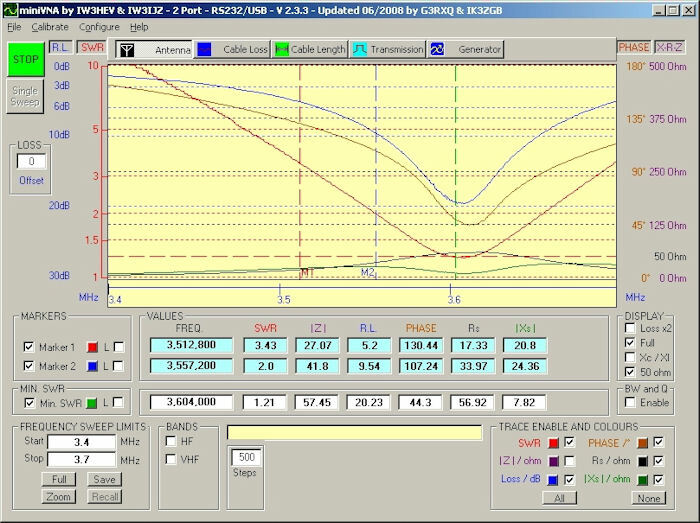 Coil calculators (e.g., ref. ) suggest that this should take about 90 perfectly close-wound turns ( = zero turn spacing) of AWG #20 (0.8 mm) enameled copper wire (CuL) on a 32 mm PVC core. Note that "Harry's Law of Coils" always applies. As Harry (SMØVPO) says: 1) You cannot wind coils like I, and I cannot wind coils like you. 2) Coil-winding data is a constant that varies from person to person. I have measured quite a number of "close-wound" loading coils that I made. With my personal coil winding technique, I obtain a close-wound turn spacing of about 0.12 mm (≈ 4 mils). Plugging that value back into the coil calculators, shows that I need about 90 turns instead of 80! So I started out with over a hundred turns (it's much easier to cut off wire than it is to cut it "on"), and reduced it from there - one or two windings at a time, until close to the desired resonance frequency. I ended up with 93 turns. Resonance frequency increased by about 14 kHz for each removed turn. Short antennas are typically "narrow-bandwidth". But I wanted to cover both 3575-3580 and 3600-3610 kHz. Changing coils is impractical. But I have easy access to the antenna, I had two 2.5 m sections of the aluminum tubing, and the radiator is easily removed from the coil core. So I decided to do the required switching by simply swapping radiators. With the 2.5 m radiator, the resonance frequency. It is 3626 kHz with a 2.4 m radiator. I.e., 58 kHz shift for 10 cm (4") reduction in radiator length. 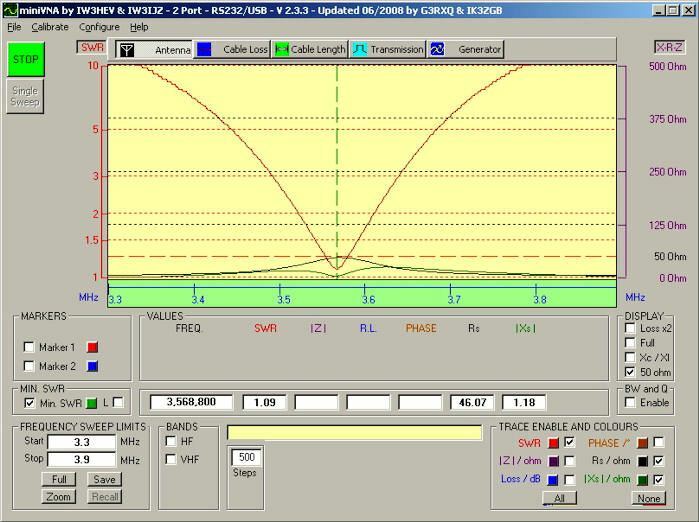 The plots below were made with my miniVNA antenna analyzer. They show a very nice resonance dip, with an SWR of 1.1. The plots were made with the antenna hooked up via a choke balun and 13 m (40 ft) of RG58 coax. 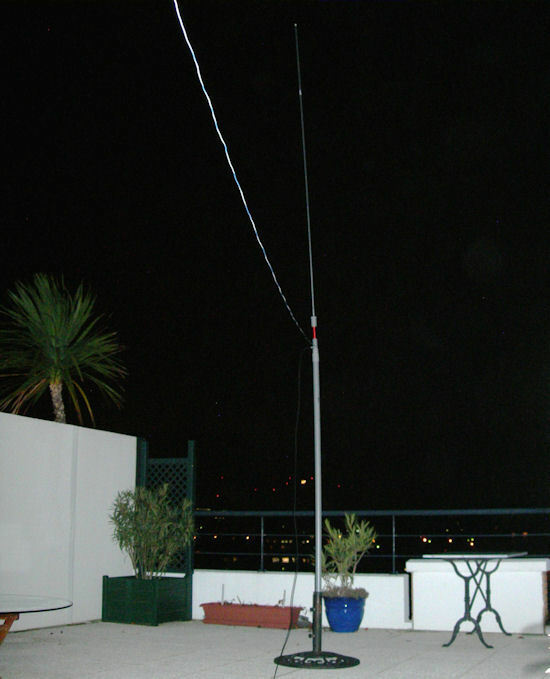 I put the antenna to the test an hour after local sunset (at my QTH in the south of France) on 31 December of 2009. Had solid PSK-31 QSOs with PE1CDE and DO5MBB, both at a distance of about 950 km (≈600 miles). Not bad! Based on this, when going from 32 to 50 mm diameter, the number of turns would have to be reduced by 60%: from 94 to 39. This time I added a generous number of extra windings. Removing several windings at a time, I tuned the resonance frequency to 3576 kHz - very close to where I wanted it. It took 42 turns: within 10% of the estimate. The 32 mm and 50 mm coils side by side - with adapter sections to my 40 mm diam. PVC "mast"
Obviously, when removing one or more entire coil turns at a time, it is hard to tune the resonance frequency to exactly where you want it. The table above shows a 50 kHz change in resonance frequency when the final turn was removed! I actually wanted 3578 or 3579 kHz instead of 3576. The radiator should actually be just a bit longer. I figured out an easy way to do this with ma radiator. I had already tapped an M6 thread into the tip of the radiator tubing. Now all it takes is an M6 bolt to adjust the effective length of the radiator. This works quite well! With the 32 mm OD coil core, my antenna analyzer claimed an Rs very close to 50 Ω, but with 50 mm diameter, this somehow increased to 63 Ω. Not sure why... The new coil should have a higher Q due to the lower resistance (less wire) of the new coil. So I expected to see a sharper/narrower resonance dip, but this hasn't materialized. But it works - so what me worry?! Also, the SWR meter of my antenna tuner (tuner in bypass mode without bypassing the SWR-meter) shows 1:1 and my transmitter is perfectly happy without the tuner. And this version of the antenna also works - without the coil getting warm at 100 W. Have had relatively solid QSOs in Hellschreiber mode on 3579 kHz with PA0KDF and PA3FFZ (≈1100 km, 680 miles) around local sunset. The antenna is definitely not (only) radiating straight up! To further improve the performance of this short antenna, I experimented with a "capacitive hat" on top of the radiator. The "hat" adds end-loading to the antenna. This is one of the most effective ways of loading a shortened antenna. The hat construction and the experiment is described on my "end-hat loaded 80 m vertical" page. If a 2.5 m radiator is OK, then a 5 m radiator should be better! From my experiments with the 2.5 m vertical described above, I still have a second radiator that is 2.4 m long. So why not simply install the 2.4 m radiator on top of the 2.5 m radiator? Indeed, why not? We'll get to that shortly, hihi. These radiators are made of soft aluminum tubing. I had already tapped a standard M6x1 thread into the ends of both radiators. All I need is a simple coupler! The threads are 2.5 cm (1") deep. I cut a 5.3 cm (≈2") piece off an M6x60 bolt, put two M6 nuts at the center and tightened the nuts against each other. This is needed so that I can tighten the radiator tubing onto the coupler. Well, in principle, the basic idea was not (so) bad. But this small-diameter aluminum tubing is so flexible, that 5 meters (16 ft) of it will absolutely not stay upright by itself. The radiator is now 5 m long, but even without wind, it bends over such that it is still only 2.5 m high! Oh well, I should have seen that coming, hi! Remember: you learn from your mistakes, and an experience is only bad if you don't learn from it! Yeah, right! It's better to learn from other people's mistakes. So don't do I as did! The construction of the 5 m tall aluminum vertical described above, clearly was not a success - to put it mildly... I need a long tube, light weight, and fairly stiff. I have been very pleased with the 3 m (10 ft) telescopic fiberglass fishing poles that I used for my 20 m mini-dipole, mini-vertical, and mini-yagi-beam. So I decided to get a longer one. The large local sporting goods store in the area where I live (south of France) has a fishing supplies department. They sell telescopic fishing poles from 2.5 to 9.5 meters (31 ft), and prices ranging from €10 - €160 ($12-180, 2015). Carbon (graphite) poles are most expensive. Carbon is a relatively poor conductor, but I am not sure if a pole made of that material somehow "loads" the antenna wire that is strung onto the pole... Anyway, I settled for a pole of 6 m (20 ft) that was reasonably priced (€12 in 2015). It weighs a mere 530 grams (1 lb 4 oz) , and collapses to a very compact 58 cm (1 ft 10"). The base section of this pole fits nicely in a 40 mm OD PVC pipe. Once again, my antenna "mast" is 2 m of 40 mm OD PVC tubing, stuck into an umbrella stand on my terrace. I made a fishing pole holder with integrated coil core, also out of PVC tubing. It will be stuck on top of the mast. 40 mm sleeve (female-to-female coupler). This sleeve has three notches on the inside, at half height. See image below. These prevent insertion of 40 mm pipe more than half way. As it happens, the base section of the fishing pole has a diameter that snugly fits between these notches. Perfect, so the antenna will not wiggle around in its holder! All very inexpensive at the local building supplies store. The 40 mm sleeve almost fits into the 50 mm pipe. I heated the end of the 50 mm pipe by sticking it in boiling water for a minute or two. The 40 mm sleeve could then be inserted without any problem. I let it stick out a little over 1.5 cm (5/8"). I also glued the 50 mm sleeve onto the 50-to-40 mm adapter. I also used a short section of 32 mm OD PVC tubing, and glued that into a 32 mm hole in side of the the 50 mm tubing. I shaped the inserted end of this piece such that it conforms to the inner diameter of the 40 mm pipe, and does not touch the inserted fishing pole. I installed a BNC jack (coax) and banana plug jack (for the radial wire) into this 32 mm pipe. I used a 1 mm bit to drill several sets of holes for the coil. The coil is tuned by removing windings from the top side of the coil. 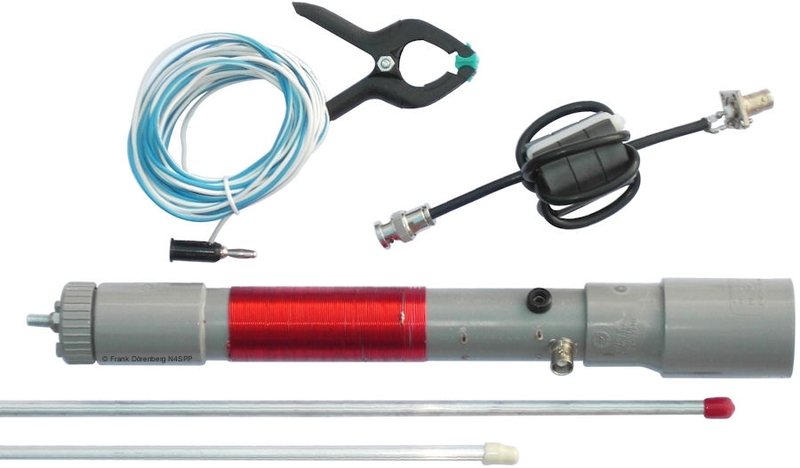 With the PVC holder and base, the overall length of the collapsed antenna is 64 cm (2 ft 1"). Total weight is 930 gram (≈ 2 lbs). The radiator is simply 5½ m (18 ft) of multi-strand AWG #22 wire (0.65 mm Ø). One end of the wire is soldered to the top end of the loading coil. The wire is wrapped 8-10 times along the length of the fishing pole, to keep it close to the pole. This may even provide some helical loading! I use a tiny alligator clip (called a "mother-in-law" where I grew up, hihi) to attach the end of the wire to the tip of the pole. I re-used the 7 m (22 ft) elevated radial wire from the above experiment with 2.5 m radiator. I started out with a coil of 47 turns of AWG #20 (0.8 mm Ø) enameled copper wire on the 50 mm pipe. This is a couple of windings more than what I ended up with for the 2.5 m radiator - just to be safe. I reduced this in two steps to 30 windings (estimated inductance: 45 μH). The resulting resonance frequency of 3605 kHz is just a little higher than my target (3579 kHz). The reduction in resonance frequency per removed turn was a little higher than I expected... But the SWR=2 bandwidth is about 95 kHz., so I'm fine. I tested the antenna early March 2010, 19:30 local time, by checking my Hellschreiber signals via a Web-SDR in The Netherlands (≈ 1100 km from my QTH in the south of France). 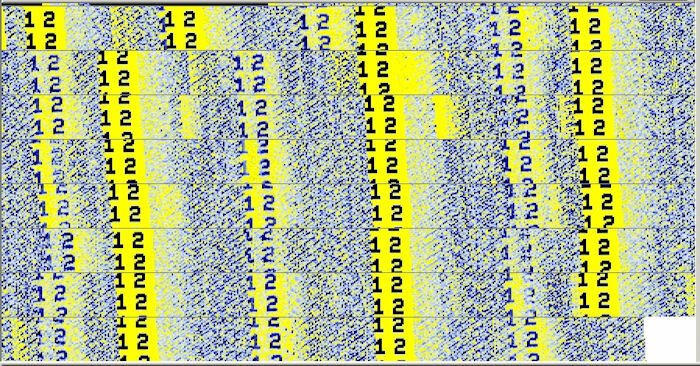 This screenshot from my IZ8BLY Hellschreiber program shows my signals after delays through the Web-SDR. Also had a 59 Hellschreiber QSO with PA0KDF that evening. Mid-March 2010, I reduced the resonance frequency from 3605 to 3570 kHz by making the radiator wire 15 cm (6") longer. I also did a quick check with 20 mtrs of 450 Ω twin-lead "window" cable instead of coax, to see if the antenna holds any promise of being useable as a multi-band. I used a choke balun at the TRX, and tried both with and without a 4:1 balun at the antenna. The associated analyzer plots are shown below. 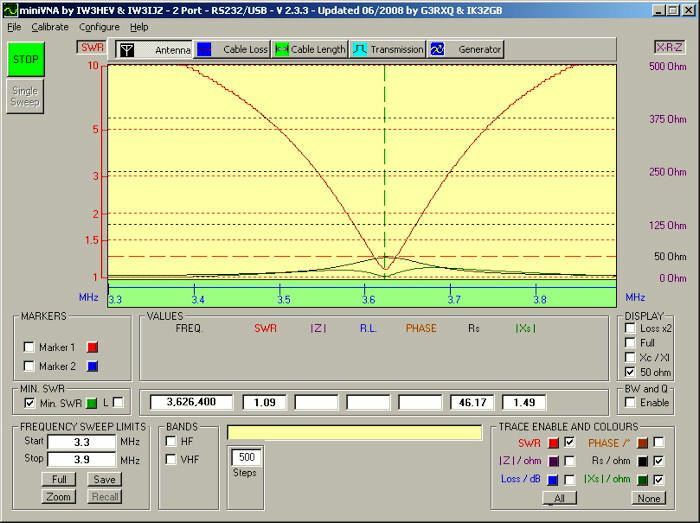 With the ladder line, the resonance frequency in the 80 mtr band is about 100-150 kHz lower than with the coax. 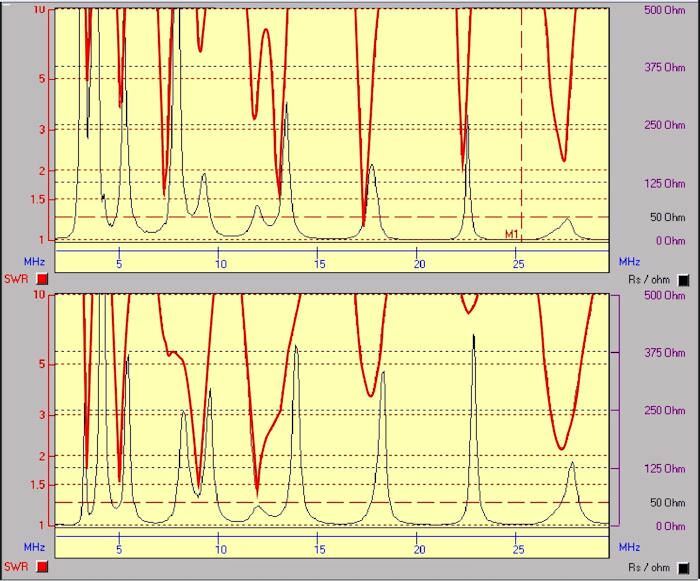 I did not do any transmission tests with these feedline configurations. 2.7 m (9 ft) of linearly loaded 3-conductor "Cobra" wire radiator. This antenna is described on this page. The same 7 mtr elevated radial wire was used each time. Tests were completed within 20 minutes, from 21:20 to 21:40 local time. Transmissions were with 50 watt on 3579 kHz. 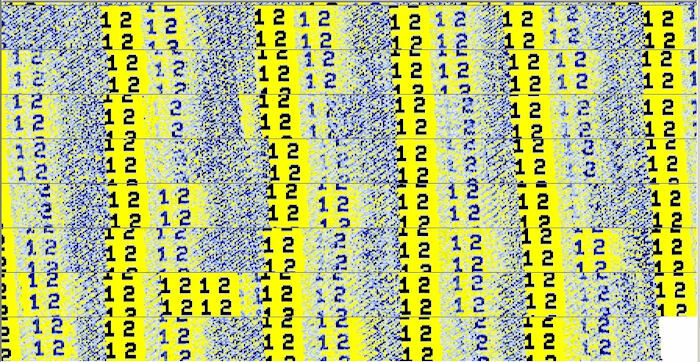 Testing was done in Hellschreiber mode by repeatedly transmitting the characters "1 2", and using a Web-SDR receiver to check my signals. The remote receiver that I used is located at 935 km (580 mi) north of my QTH in the south of France. 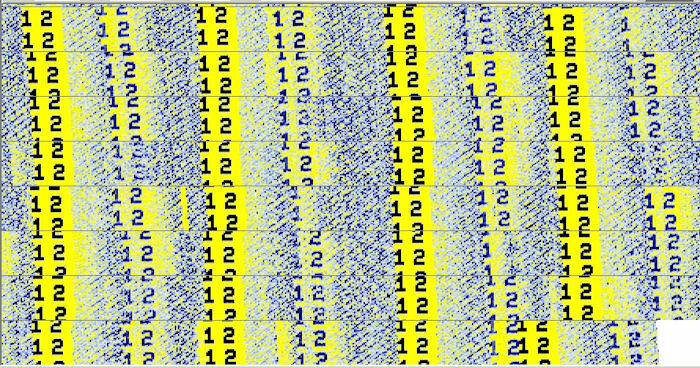 The signal processing delays in the SDR plus the internet delays added up to 2 sec. This allows me to listen to almost 2 sec worth of my own signals after completion of a transmission, and switching back to "receive". Each screenshot below represents a period of about 2 minutes, to see fading, if any. I consider this to be qualitative but a reasonably objective test. The test did not show significant differences in performance between the antennas... The tests do show that all three antennas get a decent signal out (at my location), especially when considering their size! Ref. 4: "Vertical antennas", by Ulli Weiss (DJ2YA), Chapter 9 in "Low-Band-DXing" by John Devoldere (ON4UN), edt.